The 2015 Drifz rims line has officially been entered into our system. 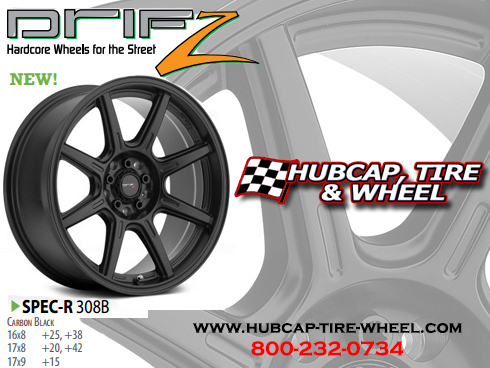 Check out the all new Drifz Spec-R 308B wheel in carbon black. It’s an awesome new look that a lot of people look for. It’s not too over the top but yet it says ‘custom wheels’ at the same time. We personally really like the Spec-R as a new addition to their line. It’s one of the most sought after styles and designs while staying completely affordable. It’s a very strong and durable wheel able to put up with daily driving as well as testing it’s limits out at the track. For any fitment questions on this wheel with your vehicle do not hesitate to call our wheel and tire specialists at 800-232-0734. They eat, sleep and live wheel and tire specs so you know you are getting the exact fitment you need. New And Re-Invented Rims From Black Rhino Wheels For 2018!